Despite what I thought was pretty crappy soil, my garden has been growing with gusto. Even the lavender I thought I had killed has a sprig of life left in it after all. It appears that this "sunlight" concept that I couldn't manage in last year's garden (which, despite being in the sunniest place in the yard, only got a few hours of sunlight a day) is paying off this year. The weeds have also been coming along happily -- and prolifically. 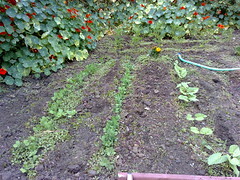 I had just finished hoeing out the spaces between the rows before taking this picture, but before that they blanketed the whole garden with a green haze. Weeds have also re-colonized the space along the side of the house that I was planning to seed with various kinds of mint. (I know mint is invasive, but better invasive mint than invasive other stuff, I figure.) I also wanted to put in a rosemary bush and a lavender bush, and maybe some squashes and cilantro (or devil weed to corpsefairy, carefully isolated from the parts of the garden she's interested in). Hopefully this will actually happen before the summer's over. I'm glad we have a very long growing season around here! I'll have to stake out all of the stuff in this picture -- peas, beans, and tomatoes -- in the next few weeks before they start to fall over and choke themselves with their own curlicues. To the right of what's shown in the picture, the chives are also coming up, looking like timid grass amid the weeds, and the beet seedlings are tiny but dense, managing to crowd the weeds out. I still need to add more basil; the one transplant is doing great but I haven't had time to get more. Do you have squash in there yet? You'll need somewhere for that to wrap itself around too; we're going to have ours just wrap itself around the fencing. Looks good! We didn't bother staking the tomatoes; we just bought those pyramidal tomato cone cages last year and we'll just reuse those again this year. I'm going to need to weed our herb/fruit/veggie and also finish that last bit of front landscaping before doing another pass at the flower garden. We tried container pot mint (to avoid the invasiveness and if the pot has a hole in the bottom then you need to cover that hole too), but we're not going to bother with that this year. I don't know...the mint might take over the whole garden eventually? I bought a peanut plant! Though one of the profs said they didn't think that peanut would grow in this zone. So we'll see. It's not like we'll die if we don't get a peanut but I'm curious if it'll do anything. We read that eggplants wouldn't work for this zone, but they were fine for us. We've got clay soil. I'd love to hear how the peanut does! They're such strange plants.